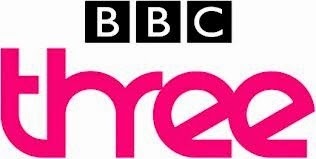 UPDATED BBC viewers have got an opportunity to have their say on the broadcaster's proposals to cut BBC Three from regular TV platforms. The BBC Trust has today launched a public consultation on the channel's future. It says it expects a provisional decision to be made in 3-4 months, and the whole process should be over in 6 months. The public consultation is open until 17th February. The BBC wants to axe BBC Three in its current format, making it in to an online-only service with remaining content on the iPlayer and on commercial social media networks. It has already axed programmes ahead of the BBC Trust's formal consultation, with some output moving to BBC One and BBC Two, with Don't Tell The Bride being revamped to cater for BBC One's older audiences. As part of the formal consultation process, the BBC Trust is launching a so-called Public Value Test (PVT). The PVT will also contain an analysis of the public value of the planned closure on the entire UK TV market with Ofcom undertaking a Market Impact Assessment (MIA). The Trust, which has the final say on the matter, has already said that its "priority throughout will be to listen to the views of audiences and stakeholders." The BBC wants to replace BBC Three with BBC One+1, but commercial broadcasters including ITV have already indicated that they are against the creation of a BBC One timeshift. In addition, most of the money saved from axing BBC Three would go into BBC One's budget. At the same time, CBBC's broadcast hours would be extended to 9:00pm every night. For viewers in the top end of BBC Three's demographic, it's the second time the TV industry has abandoned them; the first time occured when CBBC and CITV adjusted their target audience, moving away from targeting children of secondary school age. In 2006, the then controller of CBBC, Richard Deverell axed teenage dramas Grange Hill and Byker Grove and realigned CBBC to focus on 6-12 year olds. At the time, the BBC promised that there were "big plans to cater for 12-16 year olds". In the long term, BBC cutbacks may eventually reach BBC Four, which itself is dominated by repeats and has to reduce its new and original programming. But that could provide an opportunity to showcase BBC Four's gems to a wider audience and reduce the broadcaster's reliance on gardening, antiques and cookery programmes. 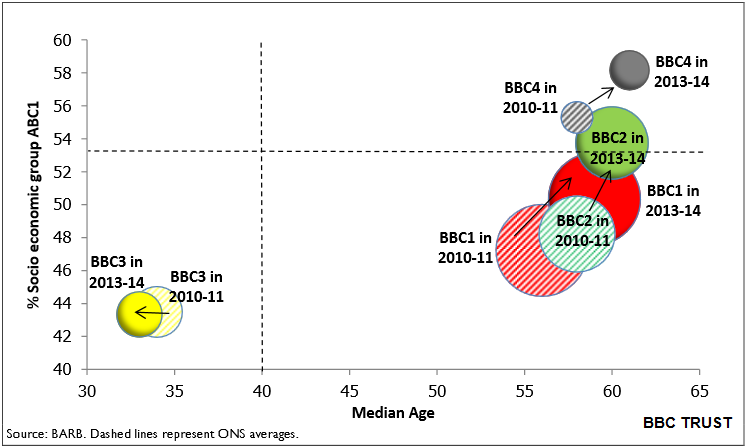 BBC One, BBC Two and BBC Four all attract viewers of similar age groups (see graphic above); the only difference is that BBC Four attacts upmarket older viewers, while BBC One is more downmarket, so it could be argued that there would be less impact if anything happened to BBC Four - older viewers are still amply catered for on the BBC's traditional TV channels. BBC Four's upmarket audiences, however, tend to be more influential when it comes to decision-making. It's not just the BBC's "numbered" channels that are facing cutbacks. The BBC News Channel's rolling news service is effectively being reduced to around 13 hours a day in April, with the remaining hours filled by simulcasts with BBC One, BBC Two and BBC World News. As the numbers accessing internet TV services continues to rocket - with the ability to curate a schedule to everyone's liking - there may be justification for all broadcasters to review their traditional linear TV portfolio. As far as the BBC is concerned, BBC One and BBC Two could then revert to what they did ten years ago when they used to showcase BBC Three and BBC Four content during the late evenings for those without digital TV. BBC One and Two would then contain 'shop-windows' for those without access to internet services with a sample of the output, but would then be able to reduce the number of repeats during off-peak hours. Why not close down "The Red Button" instead and use BBC Three for these broadcasts. This way some new programmes could still be experimented on the channel,and the crazy idea of having to push the red button to access "extra information" could be eliminated, do we REALLY need a BBC 1+1 surely most people can access BBC iPlayer or have SKY+ You View, Virgin or Freesat recording available! I almost never watch linear TV. Almost exclusively iPlayer, recordings, or Netflix. The only exception usually is live sports or news - and I watch news online more and more. If TV companies said "we are changing to only broadcast on-demand in 2016" and not linear, people would moan to start with but then get used to it - and watch what they want to, rather than just what ever is on. It is going to be several years before my broadband is up to the job of streaming TV. I can download, but so few broadcasters support that and the BBC are making it more difficult. Why does Don't Tell The Bride need to be revamped for an older audience on a different channel? Surely people watch the programmes they want to watch, irrespectice of what channel it is on? I don't know anyone that has ever said "I'm going to watch BBC1 tonight", not even 30 years ago. Even then we looked at listings and decided what programmes to watch. This should all be fixed by the much simpler approach of putting up the BBC licence fee. Save BBC3. Save the BBC.